St Peter’s and the Vatican are side by side when you visit Rome. St Peter’s is in Italy and the Vatican is a separate city state. You won’t need a passport to get in the Vatican though. 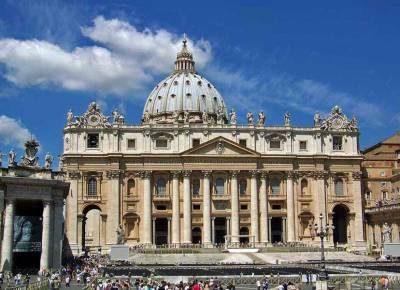 You can reach St Peter’s and the Vatican on the Rome A Red line subway. There is no admission to St Peter’s Basilica, but arrive early before the crowds build up or you will need a reservation. See Bernini’s design of the square in front of St Peter’s. Marvel at Michelangelo’s Pieta sculpture in the church. The size and design of St Peter’s is amazing. Visit the tombs of the Popes beneath the main floor of St Peter’s too. Listen to the Pope’s weekly message in the square with a Papal Audience Ticket and Presentation. It’s well worth making a reservation to the Vatican, so that you don’t have to wait in long lines outside. The Sistine Chapel is part of your Vatican tour. The Vatican Museum is too extensive to cover completely in a single day. Take the opportunity to buy Vatican postage and mail a letter. The Colosseum & Roman Forum are next to each other. You can reach them on the B Blue line subway. Make a reservation in advance to avoid long line ups. Return in the evening to view the Forum from outside the grounds, even though it’s closed. 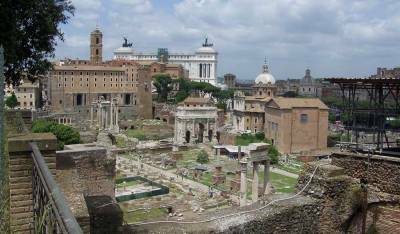 The Forum includes the Palatine Hill. Circus Maximus, the ruins of the ancient Roman chariot racing stadium, is located in the Forum area between the Aventine Hill and Palatine Hill. Immediately to the north of the Forum are the Monument to Vittorio Emanuele II and the Piazza del Campidoglio on the Capitoline Hill. To the west of the Forum is the Basilica of Santa Maria in Cosmedin. In the portico of the basilica, see the Mouth of Truth, which is a human face carved in a circular flat marble. 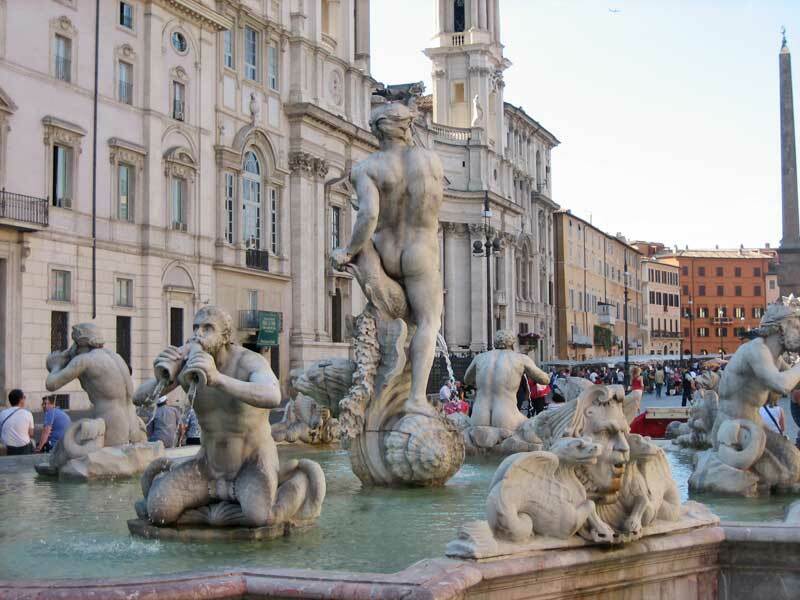 Take a guided walking tour of Rome’s Squares and Fountains or head out by yourself. 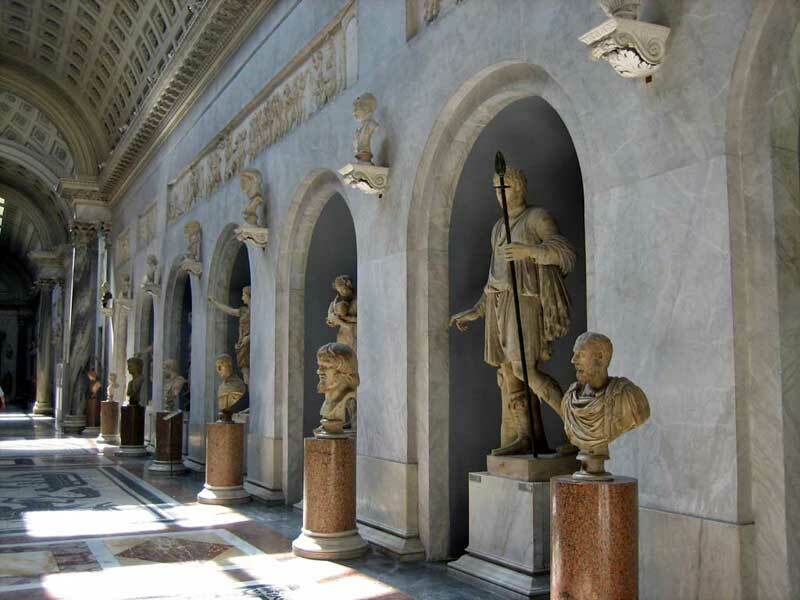 For your Rome self guided tour, start by taking the A Red line subway to the Spagna station. 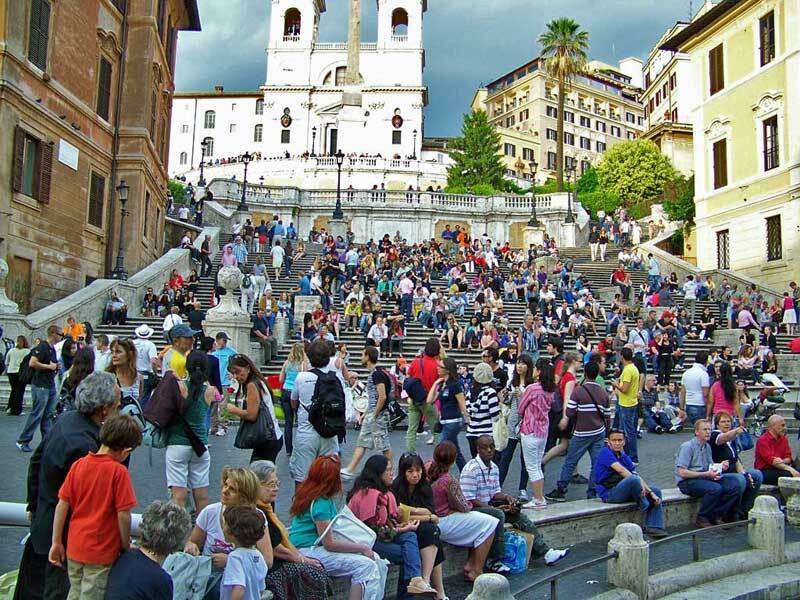 Then walk a short distance to the Spanish Steps. Sit for a moment with the crowds that gather on the steps. 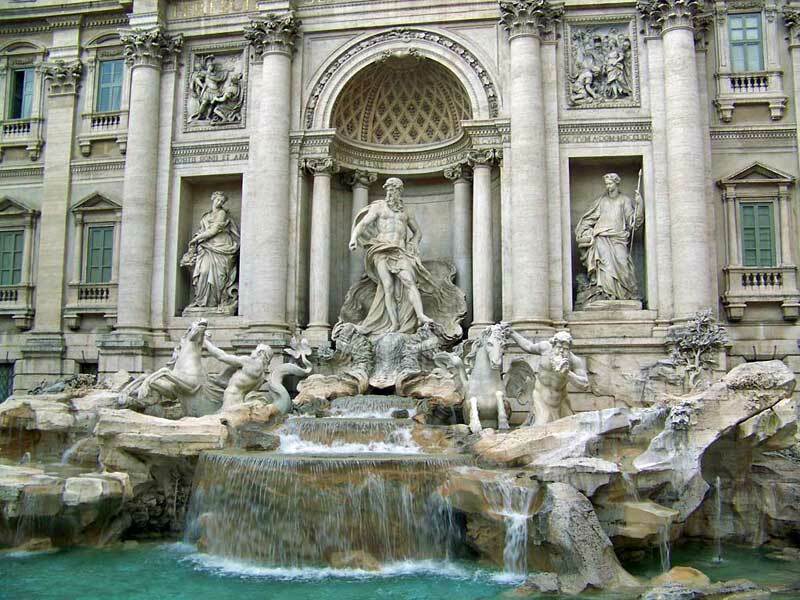 Then walk to the Trevi Fountain. Throw a coin over your shoulder into the fountain and tradition says this will ensure that you return to the Rome again. The next stop is the Pantheon, built by Hadrain in 117AD as the Temple of All the Gods. The Italian kings Vittorio Emanuele II and Umberto I are buried here, as well as the famous Renaissance painter Raphael. 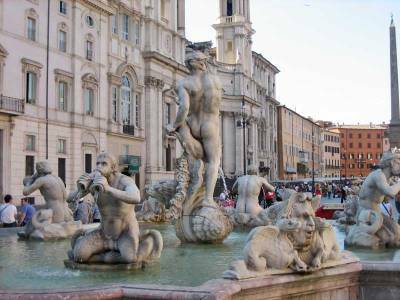 From the Pantheon, walk to the square called Piazza Navona to see the 1651 Fountain of the Four Rivers by Gian Lorenzo Bernini. The final stop on the walk is St Peter’s, but consider also visiting the museum at the Mausoleum of Hadrian, also known as the Castel Sant’Angelo. Basilica di Santa Maria del Popolo – Renaissance art by Caravaggio and Raphael. Borghese Gallery and Museum – See Bernini’s famous sculpture of Apollo and Dapne. Reservations are required. Take a Crypts and Catacombs Walking Tour of the underground catacombs, Capuchin Crypt and the Basilica of San Clemente. Rome weather is influenced by the Mediterranean Sea, which moderates the winters. Summer weather is warm and dry. Expect summer highs of 35 C (75 F) in July and August and average lows of 16 C (60 F). In the winter months, the highs average 12 C (54 F), while the lows average around 4 C (40 F). The winter months can be rainy and humid. The perfect summer weather draws the heaviest numbers of tourists. 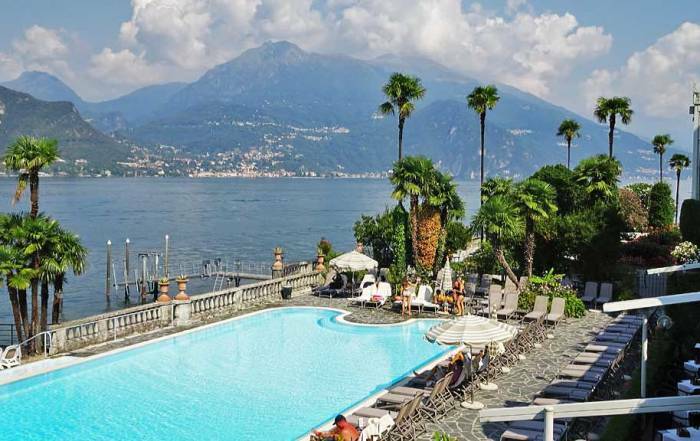 Consider May or October for the best balance between good weather and lower volumes of visitors. 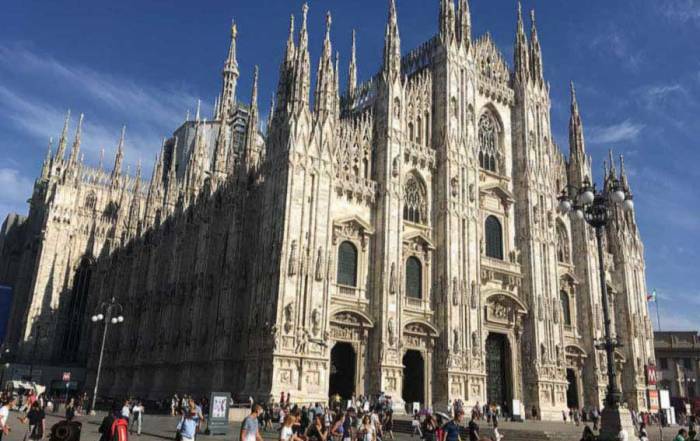 It’s easy and economical to transfer between the Fiumicino (Leonardo da Vinci) International Airport and downtown on the Leonardo Express train. The Leonardo Express runs every 30 minutes and take just over 30 minutes. Don’t forget to validate your ticket after purchase by stamping it yourself at the station. Validating is a common procedure in many European countries, especially Italy. A Terravision Shuttle Bus will cost less than half the Leonardo Express train fare. A cab will cost about 4 times as much as the train. The Civitavecchia cruise ship terminal is more than an hour from downtown Rome and access is not easy. Civitavecchia cruise ship terminal isn’t near the Leonardo Express train. Cruise passengers with only one day to visit Rome will spend a major part of the day getting to and from Rome. 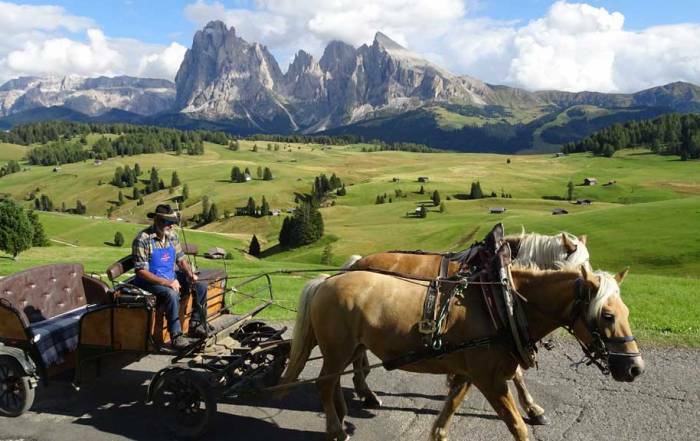 If you don’t purchase a shore excursion, a cab is your most efficient option. If you are transferring between the cruise terminal and the airport, a cab is your best bet for that trip too. The Leonardo Express rail terminates at the central downtown station known as Roma Termini. 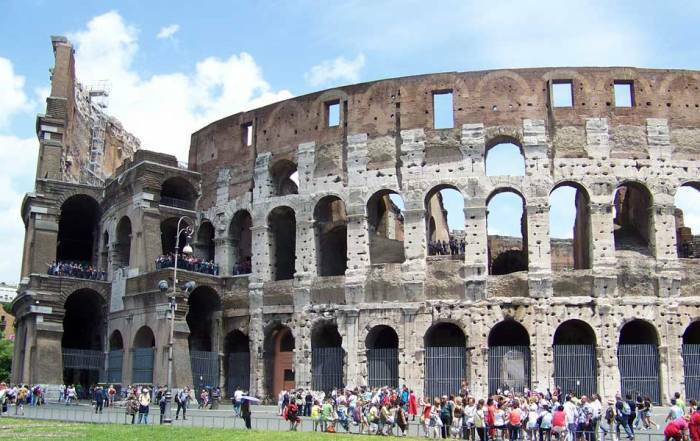 From Termini, there is an extensive network of efficient and inexpensive subway lines that easily take you to hotels, St Peter’s & the Vatican, the Spanish steps or the Colosseum. Subway trains arrive every 7 – 10 minutes at the main station. Check out the Rome Metro Map. The A Red line and the B Blue line intersect at Termini. The Colosseum is on the B Blue line at the Colosseo stop. 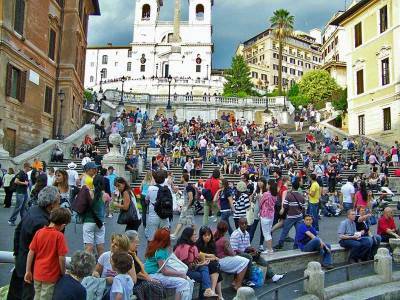 On the A Red line, you can reach the Spanish Steps at the Spagna station and the Vatican at the Cipro stop. Termini is also the main Europe rail station for Eurail connecting Rome to the rest of Italy, France, Switzerland, Austria and Slovenia. Rome is the capital of Italy. About 4 million people live there. 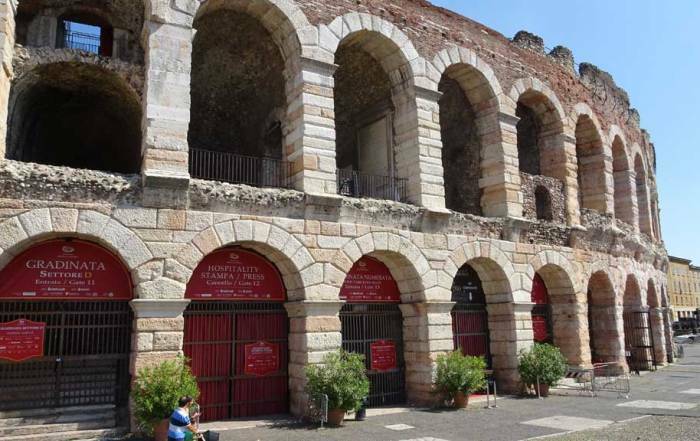 The city was founded in 753 BC and is sometimes called the Eternal City. A popular myth is that Rome was founded by Romulus and Remus, who were suckled by a she-wolf. Rome was the center of the Roman Empire when Julius Caesar was assassinated in 44BC. The Pope set up residence in Rome in the first century AD. 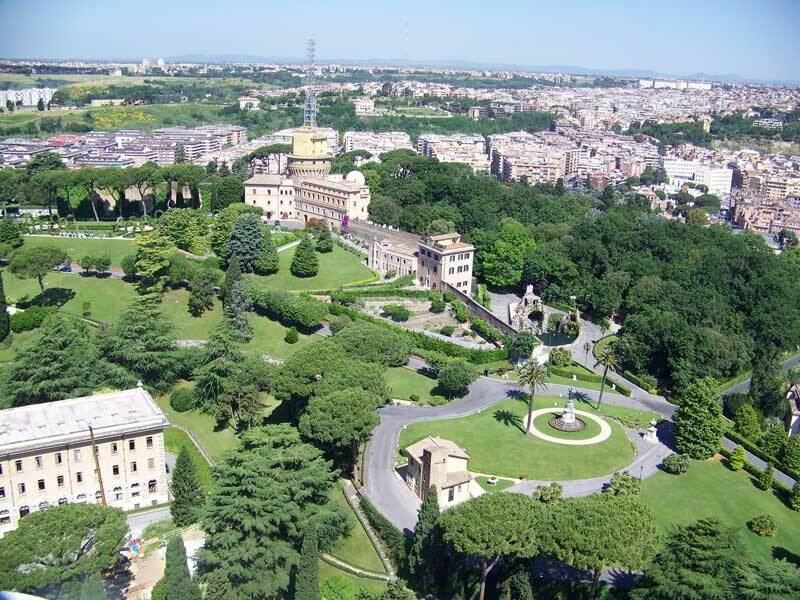 The independent Vatican City State was created in 1929 within the city center of Rome. 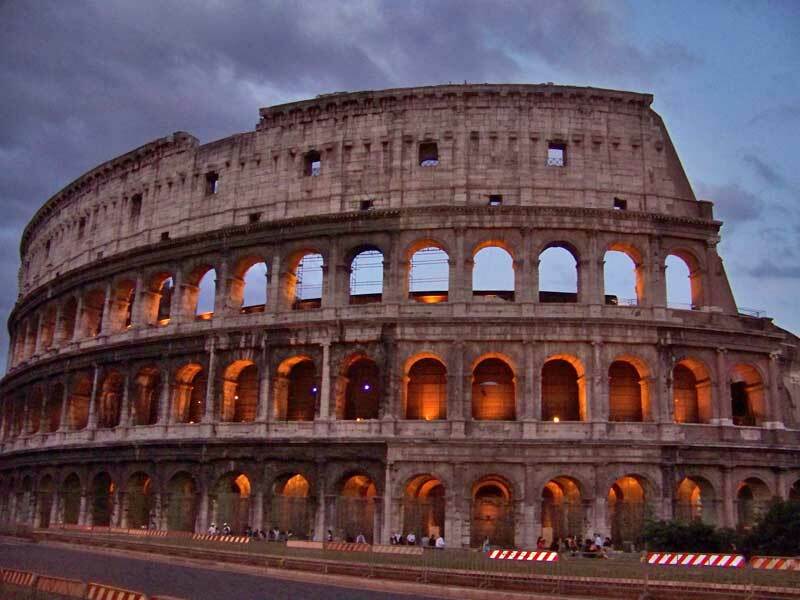 Today the ruins of the Roman Empire and the Vatican make Rome one of the most popular tourist destinations in the world.